32 Hereford is located on the NE corner of Commonwealth and Hereford, with 362 Marlborough to the north, across Alley 428, 40 Hereford to the south, across Commonwealth, 305 Commonwealth to the east, and 311 Commonwealth to the west, across Hereford. 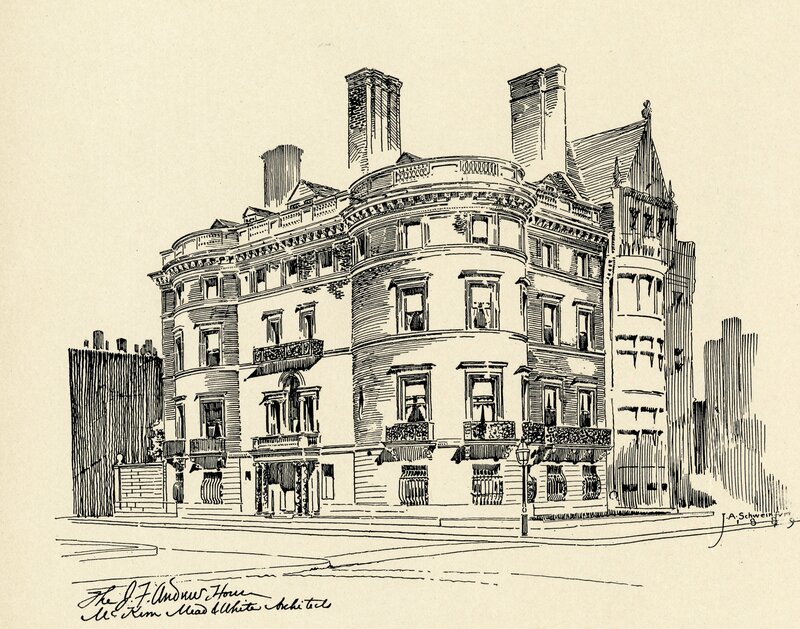 32 Hereford was designed by McKim, Mead, & White, architects, and built in 1884-1885 by Norcross Brothers, builders. 32 Hereford was built as the home of John Forrester Andrew and his wife, Harriet Bayard (Thayer) Andrew. They had lived at 215 Commonwealth during the 1885-1886 winter season while awaiting completion of their new home. 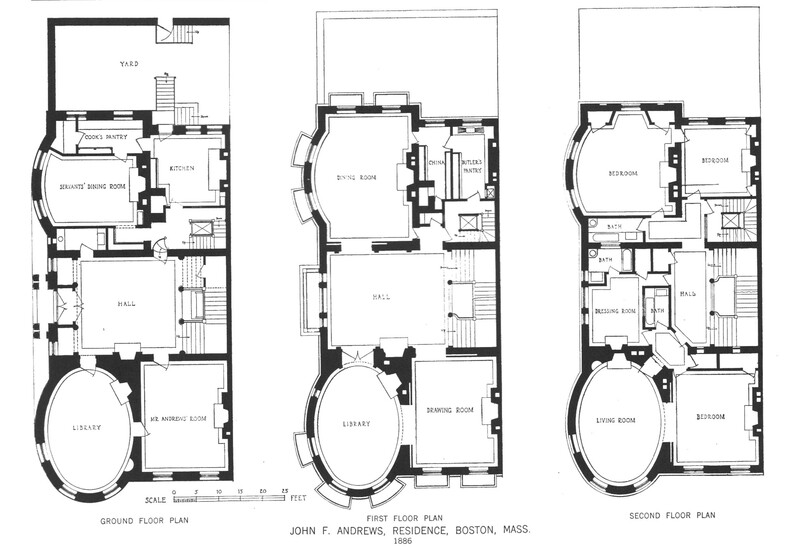 John Andrew is shown as the owner of 32 Hereford on the original building permit application, dated July 16, 1884, and on the final building inspection report, dated December 2, 1886, in both cases shown as 309 Commonwealth. The property, however, was owned by Harriet Andrew. Click here for an index to the deeds for 32 Hereford. Harriet Thayer’s mother, Cornelia (van Rensselaer) Thayer, widow of Nathaniel Thayer, lived next door at 305 Commonwealth, built at about the same time. 32 Hereford and 305 Commonwealth were built on land purchased by the Thayer family in 1883, prior to (and probably in anticipation of) Harriet Thayer’s marriage to John Andrew. 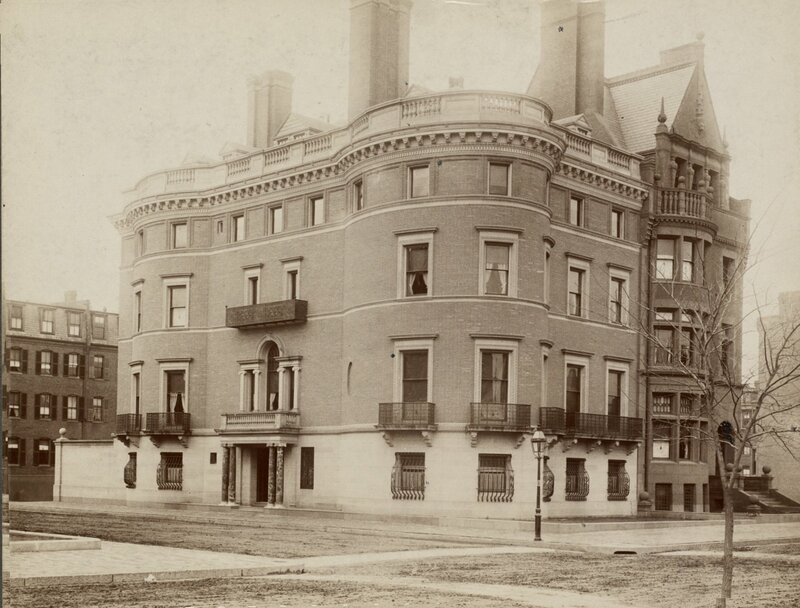 The bulk of the lot, with a frontage of 71 feet on Commonwealth, was acquired on April 2, 1883, by Harriet Thayer’s brothers, Nathaniel Thayer, Jr., and Eugene Van Rensselaer Thayer. They transferred it to Harriet, who augmented it with the purchase of an additional six foot wide lot on July 23, 1883. All of the land had been part of a larger parcel owned by building contractor George Wheatland, Jr., and originally had been part of one of four tracts of land purchased on March 1, 1872, from the Boston Water Power Company by a real estate investment trust formed by Grenville Temple Winthrop Braman, Henry Dwight Hyde, and Frank William Andrews. Harriet Thayer and John Andrew married in October of 1883. After their marriage, Harriet Andrew divided the property into two lots, retaining the corner lot for their new home at 32 Hereford and creating a new lot to the east where 305 Commonwealth would be built for her mother. 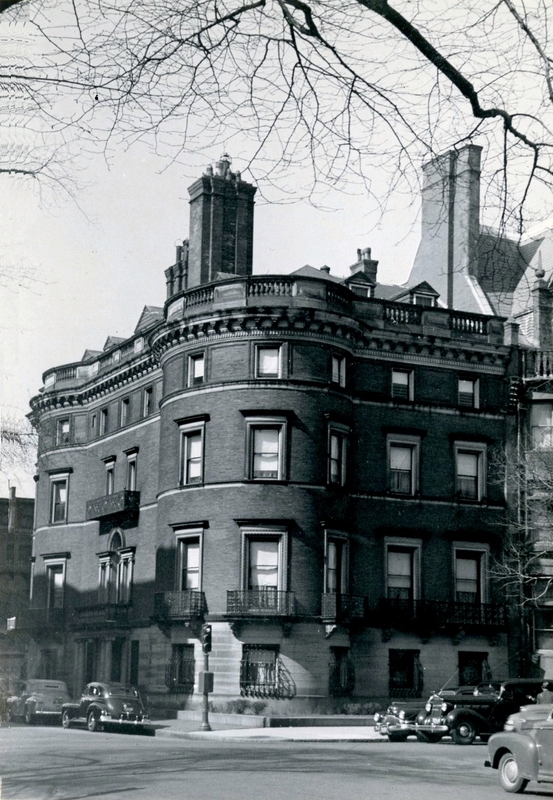 She transferred the lot for 305 Commonwealth to herself and her four brothers: Nathaniel Thayer, Jr., Eugene V. R. Thayer, Bayard Thayer, and John Eliot Thayer. 32 Hereford, drawing from the Inland Architect (Feb1889); Inland Architect Collection, Ryerson and Burnham Libraries, The Art Institute of Chicago (Digital file #IA1301_0285-0286). John Forrester Andrew was a lawyer. He served in the Massachusetts House of Representatives from 1880 to 1884, and in the State Senate in 1885. After unsuccessfully running for Governor, he was elected to Congress in 1888 and reelected in 1890, but defeated in 1892. His father, John Albion Andrew, had been Governor of Massachusetts during the Civil War. Harriet Andrew died in September of 1891. John Andrew continued to live at 32 Hereford until his death in May of 1895. At the time of his death, his daughters — Cornelia and Elizabeth — were still children. They appear to have gone to live with his unmarried sister, Edith Andrew, on Martins Lane in Hingham, where they were enumerated in the 1900 US Census. 32 Hereford was not listed in the 1896 and 1897 Blue Books. By the 1897-1898 winter season, 32 Hereford had become the home of Harriet (Thayer) Andrew’s brother, Bayard Thayer, a noted yachtsman, and his wife, Ruth (Simpkins) Thayer. They had been married in September of 1896. They also maintained a home in Lancaster. Prior to their marriage, Bayard Thayer had lived at 305 Commonwealth with his widowed mother, Cornelia (van Rensselaer) Thayer. They continued to live at 32 Hereford until about 1903, when they moved 183 Marlborough and 32 Hereford once again became the home of Cornelia and Elizabeth Andrew. Their aunt, Edith Andrew, lived with them. She previously had lived at 408 Beacon. Cornelia Andrew married in April of 1904 to John Dudley Clark, a stockbroker and banker, and they moved temporarily to 408 Beacon. Prior to their marriage, he had lived at 84 Commonwealth with his mother, Loula (Henslee) Clark Engelmann, the widow of Benjamin Oliver Clark and of Dr. George Julius Engelmann. Elizabeth Andrew continued to live at 32 Hereford with her aunt, Edith Andrew. In July of 1905, Elizabeth Andrew married paper manufacturer Charles Ellis Mason. They moved to 8 Gloucester, and Dudley and Cornelia Clark moved back to 32 Hereford. Edith Andrew moved to the Hotel Victoria at 273 Dartmouth and continued to maintain a home in Hingham. On January 13, 1906, Cornelia Clark purchased Elizabeth Mason’s interest in 32 Hereford (they had each inherited a half-interest from their mother). After acquiring the house, the Clarks had the interior remodeled by the firm of Little and Browne. They also maintained a home in Sherborn. During the 1918-1919 winter season, the Clarks were living at The Chesterfield at 371 Commonwealth, where Cornelia Clark died in December of 1918. John Clark and their children resumed living at 32 Hereford. By 1920, they were joined by his mother, Loula (Henslee) Clark Engelmann. 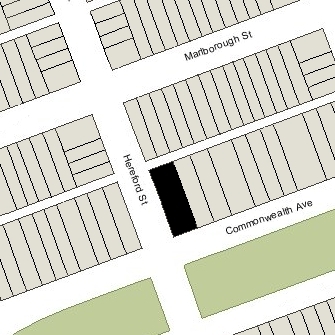 In 1910, she had lived at 84 Commonwealth. John Dudley Clark and Loula Engelmann continued to live at 32 Hereford and in Sherborn until about 1950. On July 13, 1950, the Beta Foundation purchased 32 Hereford from John Dudley Clark, as executor under Cornelia (Andrew) Clark’s will. 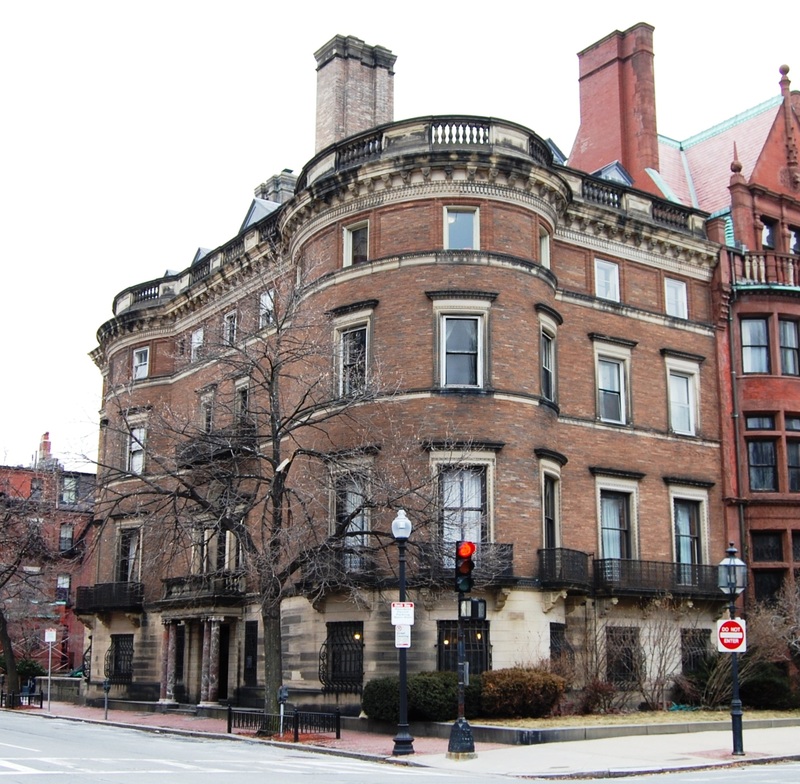 That same month, it filed for (and subsequently received) permission to convert the property from a single-family dwelling into a “technology club” — the fraternity house of the Beta Chapter (MIT) of Chi Phi fraternity. It preciously had been located at 22 The Fenway.